Profile icon from the KEYS Twitter page, highlighting the program's wish to help students succeed! Entering college, every student wants to be the first to sign up for a class before it fills up. 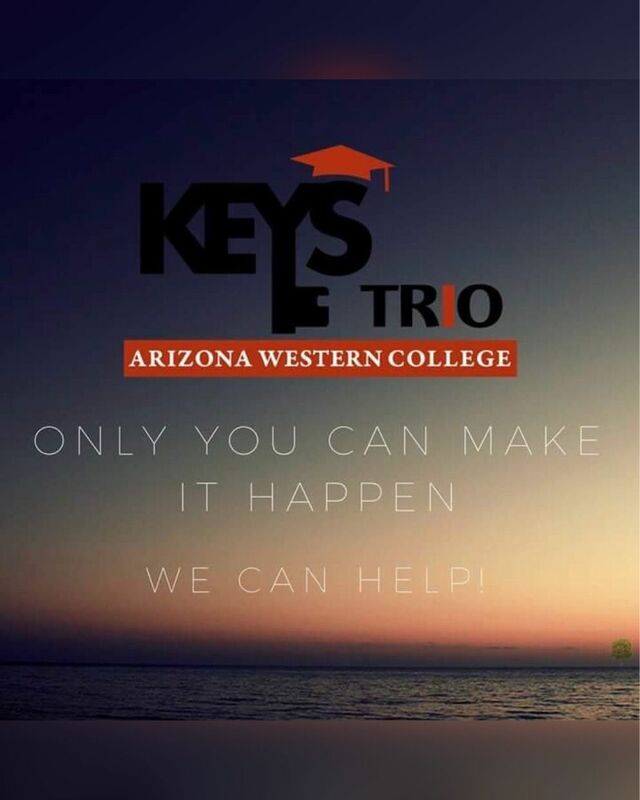 That isn’t the case when they involve themselves in the Trio KEYS Program at Arizona Western College. To qualify for this program, students must meet at least one of its criteria – coming from a low-income family, being a first-generation college student or having a disability. This program has been around for 25 years and provides the needed help for these classes of people. KEYS is a highly effective program dedicated to helping first-year college students. Joining makes it easier to sign up for class, to get FASFA financial aid and to transition from high school to college. Students are placed into classes specifically for KEYS students and making it college friendly. All students occasionally struggle in a class, and the KEYS advisors will meet with them at least once a week to provide that additional help. One feature students like about this program is the peer mentors, people they can talk to and get advice from. The official advisors of this program are very down to earth and helpful. One particularly popular advisor, Laura Shepherd, frequently monitoring students’ progress with grade checks and helping them to analyze how wisely they’re managing their time. When students meet her, she makes the environment feel safe and comfortable. “The vision of this program is to empower every student and give them confidence to complete their degree,” explained Shepherd. KEYS also has a variety of clubs to choose from, but their most active one is Club Sote. Among its many activities, the club fundraises for student trips. Club members can earn points through their participation, and the student with the most points at the end of the year can earn a scholarship at graduation. KEYS member Erica Marin describes the program as a lifesaver, describing an experience she had when she tried to change her summer schedule. She was told that, according to regulations she couldn’t do it, but then KEYS advisors were able to set up her whole new schedule. Like Marin, AWC freshman Angelina Garcia, felt welcomed and accepted when she first signed up and does not regret it. Garcia likes the fact that the program keeps tabs on her class performance. Her favorite advantage of being in the program is that the classes are all KEYS students she can talk to and work well with. Garcia says she has yet to feel uncomfortable being involved in KEYS. “I would highly recommend the KEYS Program because there are a lot of resources you can take advantage of to help further your education,” Garcia said. Students can apply no matter what year they’re in at college. The program is about creating a community where students will feel connected to each other and a little less lost in general. The goal is to help every student to succeed and get their future dream job.